Sark, one of the Channel Islands, sits between Guernsey and Jersey approximately 80 miles south of England, in the English Channel. Home to just 600 residents, the island is known for its banishment of cars from roads, with locals opting for horse and carriage instead, and is reputed to be the smallest independent feudal state in Europe. 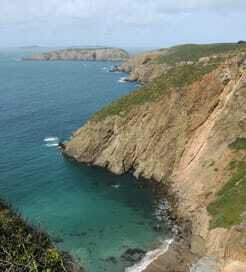 Consisting of two main sections: Greater and Little Sark, the island, as a whole, is a culmination of geographical marvels. The standout feature, La Coupee, is a long and narrow isthmus reaching 250ft high, linking the two main islands which once represented a precarious hiking route until safety fences were erected in 1900. Never too far from the sea, you can enjoy the coastal scenery consisting of a mix of sandy and shingle beaches, natural rock formations and flower-filled caves. Moreover, recognised as the world’s first Dark Sky Island in 2011, Sark’s immaculate night skies are some of the finest in the continent for stargazing, so be sure to visit the local observatory. As interesting as the scenery, the unique way of life on Sark is one of its biggest appeals. Ticking along slower than mainland Britain, the island’s unequalled tranquillity is owed to the absence of cars, buses, trains, roads, and the friendliness of the locals. Sark is a place to escape the stresses of modern living and immerse yourself in untouched nature. The best time to visit is spring, when the pastoral hills erupt into colour thanks to flourishing primroses, bluebells, foxgloves, wild roses and hundreds more species of wild flower. Linking the island with Jersey, also of the Channel Islands, ferries to Sark arrive on the east coast from St Helier. With a choice of four sailings per week, the crossing usually lasts just over an hour and is run by a leading operator in the archipelago. For more information, please visit our Ferries from Jersey to Sark page.